If Britain Leaves The EU, What Happens To The 'Polish Plumber?' : Parallels About one million Poles live in Britain, but they won't be able to vote in the June 23 referendum that will decide if Britain stays in the EU. 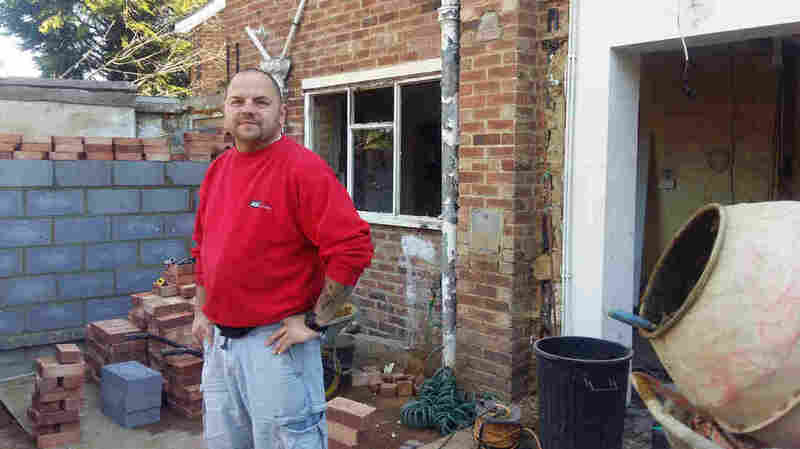 Krzystof Przadak, a Polish builder who has lived in Britain for 12 years, at a house he's renovating in a London suburb. Przadak says he now earns 10 times what he did in Poland, but he's uncertain what will happen to him and other Poles in Britain if the U.K. votes to leave the EU on June 23. Hundreds of thousands of people whose personal fates could hinge on whether Britain leaves the European Union won't even have a vote in next month's referendum: Polish migrants. Among other EU citizens, up to a million Poles live and work in Britain. They're allowed to do so, because of free movement of workers in the EU. At a typical construction site in a leafy suburb of London, a brick row house is under renovation. There's a radio on for the builders, and it's all in Polish — Polish Radio London, a digital radio station that launched in 2006, two years after Poland joined the EU, which triggered a flood of Polish workers in to other EU countries, especially the U.K.
Krzystof Przadak, who recently anglicized his name to "Chris," was one of those who moved right away. "Poland became a member of the EU in May 2004 — and I came in September. In the beginning it was very difficult, because I came alone. My wife and daughter stayed in Poland," he recalls. "Now, I am the owner of the company. I employ seven people. Slowly, step by step, I'm trying to expand the company." His wife and daughter have since joined him, and the couple has had two more children, born in Britain. "They speak English perfectly, with a much better accent than mine," he says, in his thick Polish accent. The 'Polish plumber' became the stereotype of Eastern European manual laborers who came to Britain, France and other Western European countries a decade ago. So many Poles have come to work in the U.K., that Polish is now the second most widely-spoken language in Britain. Przadak now earns 10 times what he did in Poland more than a decade ago. But the sheer number of foreign workers who've settled in the U.K. from other EU countries has become an issue in itself — bolstering groups that want Britain out of the EU. "They're thinking we are taking their work, but this is not the idea," Przadak says. "We want to work for the same money, and all the same rights. That is the idea of the EU." In the past 12 years, Polish tradespeople have become so coveted in the U.K., that there are websites to search specifically for Poles to do work on your house. Przadak has more work than he can handle. "Mainly the day starts from 6 a.m. and finishes around 11 or 12 o'clock at night," he explains. "Sometimes we have to refuse work. I simply have to say to customers, 'No, we cannot take it.'" Przadak predicts the cost of construction would skyrocket if Poles were no longer allowed to work in Britain. A recent Oxford University study shows a majority of EU citizens working here would not meet current visa requirements to stay, if Britain were to leave the union. But most people believe some arrangement would be made for people who are already here. Still, there's been a surge in Poles here applying for U.K. passports before the June 23 vote. At Ognisko, an upscale Polish club in West London — where the Polish government convened in exile during World War II — Polish bankers and lawyers discuss their compatriots' future in the U.K.
"We are living over here and paying taxes, but we respect Britons' right to decide," says Lukasz Filim, a bank branch manager who moved from Poland 12 years ago. "Britons opened their country to us, and we have a higher quality life here. We like the system — it's a friendly system — for people to live and develop." Filim and a few Polish friends founded a group last year called United Poles, which held a town hall meeting last month for Poles in the U.K who have questions about how 'Brexit' could affect them. They sent a list of questions to British members of parliament, asking for assurances about the status of EU citizens living in Britain. "[Polish] people are a bit nervous, but at the same time, many people are confident that nobody will kick them out, because we are really needed," says George Byczynski, a member of United Poles and a legal scholar who's lived in London seven years. "What we want is facts, statistics, real promises — on paper. We are part of this economy — a very important part." Last year, thousands of Polish workers downed their tools for a one-day strike, to show their impact on the UK economy. In a symbolic gesture, many of them donated blood to Britain's public health service instead. Back at the construction site, Przadak, the builder, shrugs when asked if he's worried Britain might leave the EU. "If I have to go back to Poland, we'll see what sort of benefits, what sort of progress, Poland has made just in the 12 years," he says. For these 12 years, Przadak has been sending money home. Such remittances have helped Poland's economy grow. If he has to go back, he'd be returning to a country transformed by EU membership — and he'd be leaving one too.